I have never had Dukkah before, even though I have seen it on the shelves in various deli’s and Woolworths stores. When we went to Sofia’s my dad ordered the dukkah spiced petite poissin. Inspired to finally make some, I went shopping for hazelnuts which sat in their brown paper bag on my kitchen counter for a week while I fought off the heat wave. As soon as I could face the heat of the kitchen I gave this recipe a go! 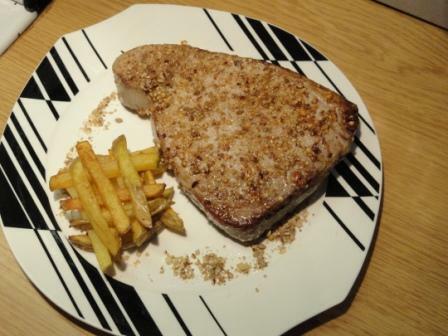 The dukkah is great, and I used it immediately to make a dukkah encrusted piece of tuna for supper. I have bottled some to take as a thank you gift to the next person who invites us for dinner. Interesting,sounds Middle Eastern?I’d not heard of this before. I’ve only used it on roasted veggies, as I follow a mainly vegetarian diet when hubby’s away and it’s divine! I’ve not made it from scratch before, so beeeg thanks for posting the recipe! I think that traditionally you dip bread in olive oil and then in dukkah as a snack with drinks, there’s a wonderful Mozambican one I tried that had lemon grass and other spices in it. I’ve also had it sprinkled on roast veggies – quite a nice way to jazz them up. So, would Mauritius be too far to come for a dinner then?